Copper and wool are the traditional gifts associated with your seventh wedding anniversary, while desk stationary sets are the modern gifts. If you are thinking of what to give your spouse or to the happy couple, these suggestions can inspire you for what to choose. You can also use them as a theme for the celebration. 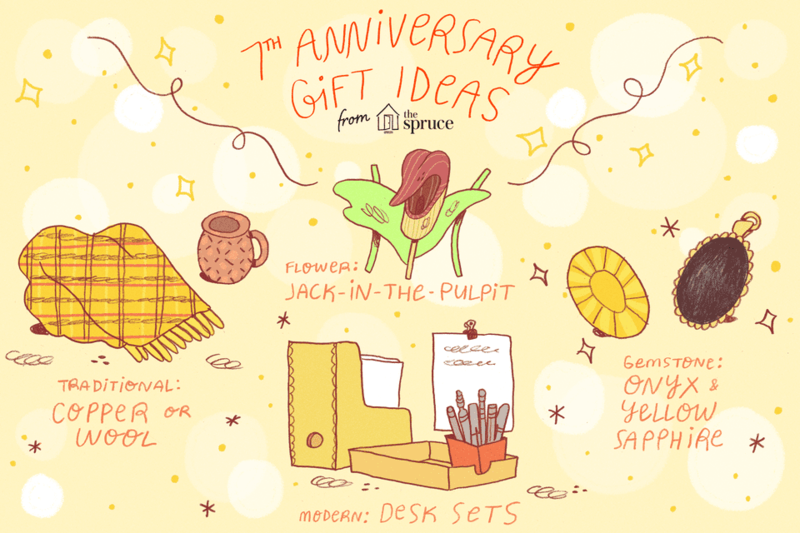 If copper, wool, and desk sets don't appeal to you, also check the gemstone, color, and flower choices for the seventh anniversary. The seventh wedding anniversary had no special gift designations until 1937. In that year, the American National Retail Jeweler Association published a list with items for each anniversary through the 20th, then for each fifth year thereafter. Copper or wool is the traditional seventh anniversary gift, varying by country. Both are recognized in the U.S. Wool is favored in the United Kingdom, France, Spain, and Italy. Copper is the choice in Russia and Germany. Copper has long had a traditional meaning of prosperity, good luck, and good fortune. Couples who celebrate their seventh wedding anniversary can indeed celebrate their good fortune in finding one another. The gift of wool represents the comfort, durability, security, and warmth that couples married this long give one another. Roman brides touched the threshold of their new home with wool. The Old Testament has a passage (Proverbs 31) describing wives of noble character as women who select wool and spin yarns with eager hands. The modern gift of a desk set is a practical gift that can be combined with one of your spouse's interests such as golf or collecting. It will be interesting to see how long this survives as pens and pencils give way to electronic communications. But a high-quality pen and pencil set should be appreciated even by those who try to keep a paperless lifestyle. Onyx or yellow sapphire are designated for the seventh anniversary. Onyx can come in many colors, but has the distinction of displaying bands of black, white, and colors. It can make a striking centerpiece for a necklace. Yellow or off-white are the colors for the seventh anniversary. This is in keeping with the copper, wool, and yellow sapphire gifts. The seventh anniversary was designated as the floral anniversary in the 1910 "The Standard Home Reference Library." You could give any gift of flowers, including a bouquet or a flowering rose bush or another shrub for the garden. The flowers most often associated with the seventh anniversary include the Jack-in-the-pulpit, a common wildflower that blooms in spring in moist wooded areas. Freesia is also considered as a good choice for a flower gift for the seventh anniversary. You could also look for perfume, scented candles, or prints that feature these flowers. Your anniversary celebration can include a flowery setting for dinner and a fancy meal, or be an intimate evening at home with your spouse of seven years. Watch the movie "Desk Set" together. Toast one another with the hope that your love continues to provide comfort, prosperity, and security like the traditional gifts of wool and copper. Think of what date night event you have been putting off for the past seven years. Purchase tickets to that show, movie, sports event, concert, or play to attend together. You can either attend on your anniversary or surprise your spouse with the tickets for a future date. Stuff a copper box with a love note, book on romance, love coupons, pictures of the two of you, etc. Knit a wool scarf, socks, or sweater. Create a fantasy trip to take together where there are lots of sheep. Take a virtual trip down under to New Zealand where sheep outnumber humans by seven to one, or Australia where they outnumber humans only three to one.